Hey, you know what's interesting about these people? No, I'm curious. Can someone please tell me why anybody cares about any of this. So, the Brittish Monarchy holds absolutely no power whatsoever anymore. Still trying to figure out why this matters to so many people. It's all silly, really. This is the first time I'm viewing The Big Picture with no comments. Now why is that? Although culture and traditions is important this feels like nothing compare to previous series. All the best, to you and to Kate and Prince William. Oh wow, I am without words. I am not even going to be watching it because I will be gone!!!!! How is this kind of obsession not really creepy? whoah .. quite creepy, great shots but ... you know, creepy. I'm sick of this nonsense polluting the American media. Get lost! Britain's stupid. All this waste of resources over a make-believe kingdom wedding. Seriously! FYI - small typo on #24 ("major gGeneral" on the 1st line). Wonderful pictures! This is certainly a positive nation-building affair. Does ANYONE actually care about the royal wedding besides the media???? The most ridiculous event of the year... and by far. It's difficult to beleive that, even in 2011, industrial countries are still putting ressources in Royalty. The ''royal'' couple haven't accomplished a thing, they have nothing special to offer, they basically are bunch of very expensive welfare recipients, sucking up money from the tax payers. what a waste ? It doesn't make any sense to give this wedding so much attention ! Partly I'm charmed and amused...partly I'm thinking "Get A LIFE" people! Why should anyone care at all about this? Has celebrity culture completely addled our brains? Love people you know, not mass-hallucinatory images that will never love you back. As someone who wasn't around for Charles and Diana's wedding I'm looking forward to this. I personally think it's nice to have a figurehead to look up to, even if they don't do much politically - and I'm about as left wing as you can get. I'm going to be one of the colonists awake at 3 AM to watch the whole affair. It may be propaganda, but you have to admit that it builds morale. The British are classier than the Yanks. The British are less enamored with and less influenced by celebrity than their media-dependent counterparts. I can't wait for it to be over so we can focus on real issues. As a "normal person", I don't care what they do, or any rich person, athlete, movie star, etc. for that matter. In fact, have in the ceremony in private or Vegas, so I can hear about some actual news. Good luck, hopes your marriage lives up thte hype. Good photo collection though. Really shows the extreme "worship" people allow themselves to have of other people and their lives, instead of focusing on their own. Great stuff. Time the world had some good news making headlines. Love the ignorant American comments - you may hate (or discard) the British monarchy but the rest of the world laughs at your amazing Presidents - Reagan, Bush, Bush, etc, etc and your truly spectacular fools like Palin. This is a wonderful nation building experience and people all over the world are looking forward to the day. Brilliant pictures showing the depth of preparations. This is a CULTURAL PHENOMENON. Just because it's not YOUR culture, just because you don't appreciate the continuing cultural of, let's say, Canada or Australia, or other Commonwealth countries, doesn't mean it's not valid and something to get excited for others. I look at every big picture and I don't necessarily "CARE" about mardi gras or the religious festivals in South American countries ... but I APPRECIATE it. This is educational. Quit complaining about not being entertained. It's part of their culture you clowns. Stop commenting on something you know nothing about. True, it's not even in the same league as the pure evil of our involvement in Iraq (easily the most shameful episode in recent British history), but this utterly irrelevant Royal parade makes me feel embarrassed to be British. How can anyone justify spending millions of pounds on nothing but pomp and circumstance, when poverty and deprivation is rife within a stone's throw of this pathetic extravagance? Utterly and totally depressing. "I'm sick of this nonsense polluting the American media. Get lost!" I'm sorry...which portion of the American media isn't already nonsense...? Those lookalikes are rubbish, oh, and the people camping are quite clearly insane and should be sectioned. I'll be staying away from the centre of London on the day, might watch it on telly though. Hey - you know what I'm British. I'm definitely not a monarchist. But I have two things to say - one is that everyone loves a wedding and I'm actually quite looking forward to this one with all its pomp and ceremony (terrorism allowing). The second is that Tony "weapons of mass destruction" Bliar has not been invited nor has that nasty piece of work, Gordon Brown. But Mr and Mrs Shringadia who run the corner shop in Kate Middleton's village have. And the butcher. And the postman. And the pub landlord. lol Revenge is a dish best served cold. For what this wedding is costing the UK every school in Britain could have a cash injection of Â£197,000. The sum of more than $34 million for a wedding. Sure this is astronomical when so many citizens of the UK are incapable of paying for the very basic necessities of life on a daily basis. I love the little girls in #15 how only one of them is sitting 'regally' lol! Great pics! Sad to see all of the negative criticism--personally I'd like to think there's a place in today's world for glamorous monarchy, amongst the lindsay lohans and charlie sheens of the media world in the US. Load of bolony.. diversionary tactics. Media hype gone mad. England has really lost it, for years ago. While I won't be one of the people to wake in the middle of the night to watch the wedding, I don't see why so many people are so upset by others' fascination with the wedding. With everything that is going on in the world, I think it's a nice break to focus on a celebration and in such a modern world, seeing the tradition involved witht he monarchy is refreshing and interesting, even if they don't really have any power. Amusing to read the comments of Americans who just don't 'get' the British Royal Family. Why are all of the US channels all over the wedding if the American population don't care? Strange. RE: #15: her majesty would never cross her legs a the knee. Ankles only! I'm British, living in the UK, and I have little interest in two rich people getting married. Personally, I'd rather not have a monarchy. But let's get a taste of reality here - one of the reasons that the monarchy endures is because of its popularity, no more so than with foreign tourists, who pump in millions of dollars to the UK economy, traipsing around Buckingham Palace, Windsor Castle and other places associated with HM The Queen and her brood. Americans seem to be the biggest fans. The lavishness is excessive, but is it that different from the fortune spent on celebrity worshipping at the Oscars? It's just business! The nasty comments on here say far, far more about the people saying them than what they're complaining about. Is this a war, cancer, an environmental disaster, a global economic recession? No. It's two people getting married. So grow up, live and let live. What a lot of miserable folk there are in the US of A who cannot enjoy the happiness of a special young couple getting married this week and who happen to be the center of world attention rather than the US of A.. In a world weary of looking at despair and hopelessness to which there seems no end, give us a break and rejoice with those that rejoice for once.For tomorrow the news will still be the same as before but perhaps even worse. 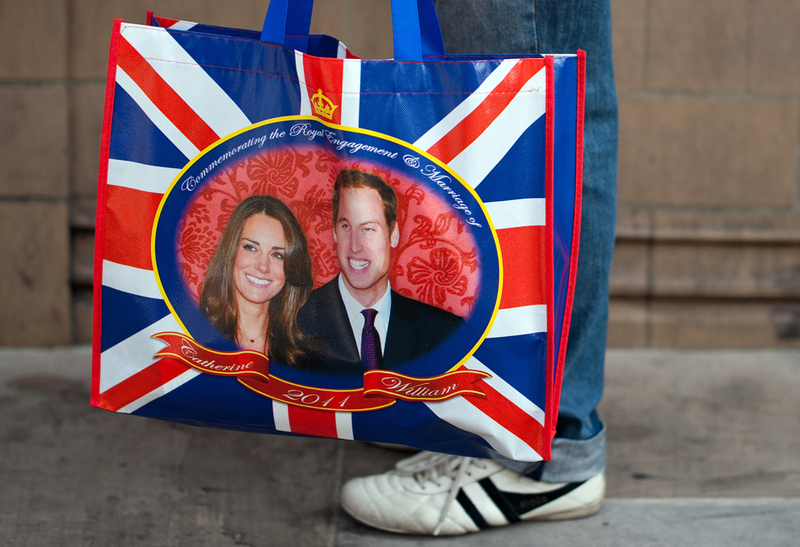 i thought people were being too dramatic complaining about the wedding coverage... but the masks with cutouts of their faces and william and kate tea bags are getting a little out of control!! creepy. Et tu, Globe? Great group of pictures that capture the madness. Loved number 4. That looks like one tough tailor. I don't plan to watch it and I couldn't care less about the royals, but I also don't feel the need to criticize anyone who does! The William lookalike in #29 looks pretty hot, wonder if Kate would notice if he replaced the real one on Friday! Comment 30: You haven't heard of the British paparazzi? The British are, on all counts, "classier" than the "Yanks," but to say they're less influenced by celebrity (an alternate definition of the current royalty), or less enamoured (the British press are NOTORIOUS), just shows you're unaware of media outside of America. This is a rich and delicious show of tradition and ceremony that dates back centuries. It is beautiful to watch, beautiful to listen to (Anglican wedding vows and music), and a treat to share in something so simply joyful. I value it highly, but naysayers are permitted to simply NOT view or comment. Go play video games. Much more important than history. Oh yes, Yanks--be proud you don't have silliness like this in your country! What are a thousand years of national culture and history compared with the important things you care about? There isn't many things about which we, third worlders, can mock you, English; but this is certainly one of them. Haha! Let's celebrate people who were given a title and rights just because of the womb they came from! Welcome to the dark age! How i just wish i was there to witness this!! Do the British have nothing better to do? No different that the in the US and their obsession with the idea of the President. All I see are a bunch of hypocrites, the US and their obsession with the president is no different than what is going on in the UK. Whats with #14? Shes got a huge rock and money coming out of her dress and falling from the sky. Is she seen as some kind of gold digger or something? I went to the same school as Kate, I actually met William before her and he only had eyes for me, but I let her have him because he wasn't my type. I wish them both much happiness, I've got my own prince now anyway, well not actually a prince but he's got royal blood. I met him at Tesco. Oh, some of these comments just make me laugh. Let the British people enjoy this joyous moment for Kate and William. that you go bonkers about. No one says you are crazy when you spend days camping out for a NFL Superbowl. Looks like fun! And Kate is hot. Please do not stop premier league... I really hate monarchy. The teabags in #14 are really funny. And I definitely find the Union Jack an ugly flag. Complaints from americans that the brits are going over the top? Two words - Tea Party. 1. To those from the UK.. the whole point is if you didnt have the Monarchy there wouldnt be as much tourism and the pathetic Â£34million the wedding cost is nothing compared to the tourism it brings in due to the general fascination the world has with England. 2. To all you completely uncultured, naive and brainwashed yanks. Yes there are things called traditions and yes people are proud of them. Your country is a joke, im not British, its a worldwide fact. The royal family and Paris Hilton are dimensions apart.. read a book. 3. To any other miserable loner on here.. How is a day off having a laugh with a cause to celebrate something positive a bad thing? Even if it is make believe? for all the taxpayer money spent in this wedding, the tourist proceeds will pay back 10 times over so don't use money as an excuse to be just another mean party pooper. i agree - its nice for some good news, to have a cultural event that draws people together. just the smiles, the cheer, the reason to have fun! Proud to be English, we have a facinating history good or bad, this is another part of the story....yes there are some terrible events taking place at the moment but I bet most of the people here providing negative comments choose not to do their bit about it yet they still complain when something good happens....its a wedding, a MASSIVE wedding at that. I will be attending a party, getting dressed up and helping my young son have a HAPPY MEMORY to hold forever. Im going to give to charity, chill out, have fun, and lap it up! go Kate and Will Wahoo! Yes its costing us tax payers, we paid for it, might as well enjoy it! Another stunning set of images. One bit of pedantry, however. It is only called a "Union Jack" when flying from the Jack Staff (a flag pole attached to the bow of a ship). It is more correctly known as a Union Flag. Don't bother with this event please..
For all Americans saying this is a waste of time/ money, don't worry most people here in England don't really care either, it's just the media gone mad. They even know that no one cares but still report it like it's extremely important. As to them not having power, the Queen advises the PM a lot. Which I'm glad for, cause she's wise due to the amount of time she's reigned. How you wished you had such tradition in your country. This cannot just be bought, it is hundreds of years of tradition. The British Monarchy holds more power still than anyone else in Britain, she has the right to liquidate parliament and rule over any laws set by herself or the government. I am shocked by the sheer volume of ignorance and apparent spite posted for this series of pictures, by people who seem to have no understanding of either England and its traditions and/or the role/position of the Royal Family. The Royals pay for themselves- that's a fact. To say they are a waste on resources is ridiculous when they help contribute by bringing in an estimated 1.26 bln for the country annually (tourism and other sources, source: Freedom of Information Request, Aug 09, 2010), funding from tax was cut to neutral over ten years ago (no Royal Yaught, opening the palace for visits etc- or has everyone forgotten this? source: Freedom of Information Request, May 13, 2009). It seems to also be completely ignored that the Royals are huge contributers to Charities and Green Energy year on year, both in cash and PR terms. So when you look at it, you have a wedding between two people, following traditions that have been in place for hundreds of years, bringing in cash to an economy in trouble. YES there are costs (policing etc), but a Â£26m security bill is offset by income- and whats the alternative? Risk danger to them (or anyone else in the vicinity)? Come on guys, thats no argument. I have no love for Britain or the Royal Family in particular- but I'd much prefer to be balanced in my rationale and better researched in my facts before posting so vehemently as some here have done. Just relax, and try to enjoy what by all accounts should be a great show! Are these two love birds related already? I'm pretty sure that Charles and Dianna were related, or a couple generations in Charles family were related and produced "pure" blood lines. LetÂ´s just throw all tradition in the garbage, like you history-less americans. LoL I cant believe you people ... I dont know why all of you have a hate comment about this event? ..and obviously everyone of you are AMERICANS! the whole country is in debt, they government is cutting funding everywhere yet it seems to be ok to spend millions on those two tossers getting married. You guys still eating mashed peas and carrots over there? 5 The Royal Family are figures who can bring media/public attention to situations/events without being tied down by politics, they aid international diplomacy and to some can be (good or bad) role models. Is this a joke? 2 BILLION people are estimated to watch. GOOD ONE! regardless of the thoughts they invoke these really are fabulous pictures ! God save the Queen, She makes more money than a president and with less mess. I'll watch live on TV!! yeah! @RJ Buddy not all the homo sapiens are located within the east coast and west coast of America. Just for your information there is a Big thing called World, out there and there are billions of people who live in the place called world. These people are estimated to watch not Dumb Americans! Well the wise Americans would still watch! Just the dumb ones like yourself don't care about world and live in your tiny town in some Mid-west state! I do not understand the monarchy. If I were British I could not stand the thought of a select group of people spending my money on a life of luxury. They have very little power. What's the point of the Queen other than a figurehead? I know she must be asked to form a government, but really, is that anything more than a show for the people? I just don't get it. I am an American and I can"t wait for the wedding! A bit of happy news in a sea of bad - let's face it, 2011 has been pretty awful so far. Plus, I remember when William was born, I watched him grow up, and I think it's fantastic that he is marrying such a wonderful girl. Best wishes to the happy couple! Hey AndiG - Paris Hilton is invited to the wedding actually along with several other American and British celebrities like Posh Spice and other classy people. I think this is fun to watch. I wouldn't travel to England and camp out but I'll probably get up early and watch it. The Brits put on a good show. I hate ignorant American-bashing though. I'm no fan of the royal weddings, or weddings in general (expect to my wife of course - here's to you, honey). So all the commotion seems personally peculiar to me. But it is not my culture, so I have no context for it. I appreciate the desire and need of this culture to express itself in this particular way, which is why I tune into this website, the big picture -- to get a glimpse of the different modes of expression around the world. Some say what a waste of resources (time money attention). Similar comments were made in this blog about the World Cup in S.Africa, the Commonwealth Games in India, the Olympic Games in China. Why divert important resources to spectacle? Such spectacle is essential to culture, to society. We are social beings. Our social structures require such spectacle to retain cohesion. For me, if there were no sports, I'd go live in cave somewhere and eat moles for dinner. I agree with Karl. I am an American. I am getting up at 3 a.m. I am enjoying every minute of this event. God bless them. Something joyful, for a change. "...how nice it is to have a Monarchy." - Indeed. Just ask Bahrain. Wow, there are some really ignorant, mean-spirited and downright dumb comments here. If you can't respect the traditions and customs of another country, fine, but don't feel the need to spew such vitriole online. The 'bravery' of people on the internet never fails to amaze me. Your mothers must be so proud. I think you'll find that we wouldn't do the same to an event you cared about, such as your President being inaugurated. I can only put it down to sour grapes. You have such a short (and ignominious) history that you envy ours. You know what? Kate Middleton may very well be one of the most beautiful women on the planet. Nicely done William. Nicely done indeed. It really is just a part of modern culture...but really...what this is costing the taxpayer of England. That alone should be a reason not to do it. I bet Will and Kate would much rather not have all the hype, but what can they do? It is expected of them. But I agree with reply #34...I look at every big picture and I don't necessarily "CARE" about mardi gras or the religious festivals in South American countries ... but I APPRECIATE" the photography. They're throwing this money back into the economy, are they not? What about the workers involved? Surely a lot of people will benefit from this. To the Brits who are suggesting Americans disapprove because we "don't understand tradition": You are mistaken. We understand it fully. So fully, in fact, that we fought a revolution to free ourselves of the absurd notion that someone can be "special" by birth. The entire concept of "royalty" is an affront to every principle of human dignity. If this insane spectacle of make-believe entertains you, by all means go ahead and be entertained. But don't expect everyone else to care about the emperor's new clothes. Wow..!! is The Event everybody washing tv tomorrow...good pictures..!! thanks for share. I need to ask for your help. I remeber that "lion" tattoo from photo #4. But I don't know what that means. Is it conected with a some sport team? Dear Kate and William, Haiti, Japan, Afghanistan, Ivory Coast, Libya, Yemen and Syria whish you a great wedding and a long life. I'm an American, and also a wedding photographer, and I would LOVE to be there. I think it is grand. As Commenter #1 asked, "Can anyone explain this to me?" Though on the American side of the Atlantic, I think I can. The British Monarchy is a symbol, a symbol of Britain herself. Although the monarchy lost most of its power in the Glorious Revolution, and has lost all the remainder in the centuries since, still it retains its place as the residence of British sovereignty. This particular marriage, furthermore, is not simply two people getting hitched, as marriage is all too often conceived of nowadays, but as the creation of a coming generation through the issue of the marriage, called children. The marriage of Prince William and Kate establishes the perpetuation of the royal family, and thus it symbolizes the perpetuation of the entire nation of Great Britain across generations. In this way, the royal wedding is not about two people who are getting married, nor is it about the millions who will be watching it, but is larger still. It represents the perpetuation of Great Britain from the past, through the present, into the future. I agree with "Amazed by Idiocy", post #87. I disagree with everyone who are labeling people. Not all Americans feel the same way, likewise with those from England. I am American. I rather love and enjoy these English traditions and I would love to visit sometime. On the other hand, I love and enjoy American culture as well. Please, don't stereotype. Each person is an individual and no one here represents anyone other than oneself. I understand that some people may think this is stupid and its times like these when they should just keep their mouth shut and respect other cultures. However we really don't need to go around bashing each others cultures. Theres stupid stuff everywhere whether it is the USA or the UK. We all have our idiots. There is no country that is better than anyone elses and its that kind of thinking that causes wars and suffering in general. Just get respect for one another. I agree that it is nice to have something happy in the news for once and taking a even just the tiniest break in US media from the war and crappy economy. I like being able to turn on my T.V and seeing something other than suffering for even just two minutes and I like to think that maybe these two can make it and if not I like the fact I can say, "I remember when they got married." If you don't like it don't watch it. Simple as that. For many around the world its like a Bollywood movie---forget reality and watch it like an unreal story and fantasy. It's a British thing, a unique past identity of the British inspite of the long gone empire. It is money better spent than in thoughtless foreign wars like that pursued by Blair thru deceit and deception. Once every so often such events show that there is British Royalty to be aware of, regardless of what they contribute or don't. It is probably the only MADE IN ENGLAND thing we will encounter today. So much ignorance.... All you people that have something to say against the weeding , try to remember all the crap that is done in USA for other crappy people. Isnt this stupid also ? Many of the US citizens do not even know their own history but they try to express their opinions regarding traditions in other countries. You people act like that idiot Seinfeld that considered this all a joke. You as a country have 250 years of tradition, if i may call that tradition, and you have the nerve to comment ? Get lost and try not to think about Las Vegas when you talk about marriage. This is what predator drones were built for. Great pics!.. nice topic as well!.. There are also good things in life, despite what we are used to see on tv. Yeah, but can they walk on water like Barak Obama? Really? Most of you wish you could bend the world to your vision if you could! It would be a narrow and smaller world than even you could imagine. Ignorance is bliss and this is how we ended up with Berry Obama as president. If you don't care than why were you looking and commenting? Do you really think your thoughts are so big and bold as to effect some kind of change? Being a Royal they can back up good deeds with action and they do. God Save The Queen! I wish the Royals well. Fairytale...Prince plus Princess equals love happiness and happy endings!! In this day and age, we all need a little fairytale!! That is why we care! Let them have their ceremony. Should be a good show. Too many grinches commenting here. The royals are a better bargain and less harmful than the stuffed suit in the WH. Wish I was able to see this....all the pageantry is just GRAND. As far as I am concerned it is great! Hestike h forada sto alwni. Guy at #20 needs to get some eye protection! Media is really stupid to make this as an big event. I wish you would just shut up and let me enjoy the wedding in peace. Some people actually *GASP* like the Royal Family!! And frankly I'm sick and tired of your constant bitching. Don't you have a rainforest to go and save and get lost in? I guess this is what happens when the princes have no sister to wed? Polluting the bloodlines with outsiders. What a shame. To be fair, Kate is very pretty. Whaaaat a site i like this. Nice, beautiful, amazing result of snaps. Really you work on this site you can do the hard work. Wow. I am quite upset at all of ethnocentrism on here. Are all of you not members of the world?! This is a world event that WILL effect everyone. Just because you are not a citizen of the Commonwealth nation doesn't mean this will not effect. This is another event in a thousand years of rich history. This wedding is a huge event! There is so much culture and history being celebrate. Not to mention it would be nice of you all to be happy for two people celebrating the start of their life together. The British Monarchy is a symbol of the entire nation. Not the mention the 16 sovereign states under the constitutional monarchy. It's so important to the people, and while they may not have "power" in politics, the people sure do love them, and they have a ton of influence on the people. If you don't like it don't comment. Every nation has ridiculous things within its boundaries and this wedding is not to be included. It doesn't matter if you are from USA or UK, your country has had good things and bad things. I am from the USA. I am proud to be American, but more importantly, I'm proud to be part of this world. Congrats William and Catherine, and God save the Queen. God save the Queen, from a proud Commonwealth citizen. I am American. I did not wath the wedding ceremony on T.V. I do love the British people, I understand some who feel it is an aweful waste of money. However, I love the tradition and feel the rich history of England should be preserved, and I wish the Bride and Groom much happiness. To the mean spirited bloggers in here..Bugger off ! "Master tailor Lance Sergeant?" Surely after today he'll receive a commission to "Master tailor First Lieutenant"
Haha! Why are there dollar bills on that tea bag in pic 14? shouldn't it be pound? Poster #134, Andrea, I totally agree with you. Bah you're just jealous.You don't have history culture and class. Heh! Anyway, the Royals are cheaper than the politicians. Less than an pound per year per taxpayer while benefits scammers and MPs badly studied projects cost a lot more. They bring in income via tourism. So what about the hungry people of the world? Do you actually have an idea how much charity work they do and how much money they generate? Plus the UK on a whole are actually good at giving. Are the wars caused by them? Nope. Caused by greedy leaders of those countries. las fotos ,son perfectas. reflejan tambien la opulencia de las monarquias, y como aÃºn siendo pobres ,les seguimos besando el culo a la maldita aristocracia que ha vivido del cuento toda su vida. luego nos quejamos de como va el mundo,cuando en realidad no mostramos rechazo y desprecio sino admiracion a todo eso. First major scandals within two years...divorced by 5 years. Despite all past experience, the royals just can't seem to grok the idea that 'marriage' isn't a sustainable arrangement under the deeply flawed and pressurized conditions in which they exist. no one cares all you hear is the royal wedding blah blah blah....... gggrrrr it has just gotten two sad. i mean tea bags! !